The Al Wusta site in Saudi Arabia, where the finger bone was discovered. A single finger bone found in the Saudi Arabian desert has provided unprecedented insight into the early migration of our species out of Africa. At 90,000 years old, the bone is the oldest confirmed Homo sapiens fossil found outside Africa and the Levant. It contradicts received wisdom concerning the history of humanity, suggesting instead that people were spreading far and wide 30,000 years earlier than previously thought. The discovery is “a dream come true” for Professor Michael Petraglia, an archaeologist at the Max Planck Institute for the Science of Human History, who led the project that found the bone. 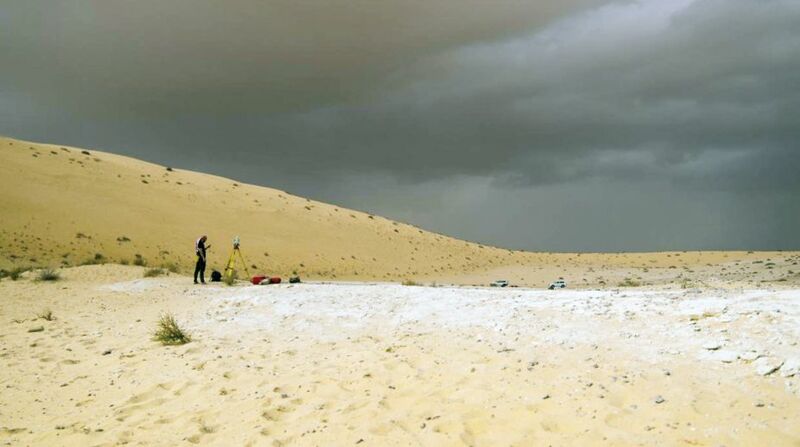 Found at a site known as Al Wusta in the middle of the hyper-arid Nefud desert, the bone is the culmination of a decade’s work by Prof Petraglia and his colleagues. During this period they scoured the region for signs of early humans, seeing it as a natural “stepping stone” for humans leaving Africa. “We found many archaeological sites; many animal fossils, but one thing was always missing – ancient human fossils,” said Dr Huw Groucutt, an archaeologist at the University of Oxford who directed the field work that led to the discovery. That all changed with the discovery of the Al Wusta finger bone. Following the fossil’s discovery in 2016, the scientists spent two years subjecting it to rigorous tests determining its age and confirming that it did, indeed, belong to a member of the Homo sapiens species. The gender and age of the bone’s owner are unknown, but based on their analysis of the site the archaeologists think they belonged to a flourishing community in what would have once been lush grassland. Hundreds of animal fossils were found at the site, including those belonging to hippopotamus, as well as plenty of stone tools made by humans. These findings were outlined in a study published in the journal Nature Ecology and Evolution. Though measuring no more than 3cm, the finger bone has big implications for our understanding of early human history. “Traditionally the movement of modern humans — our species, Homo sapiens – out of Africa has been conceived of as a single rapid movement 60,000 years ago,” said Professor Petraglia, noting that this view was supported by genetic evidence. In recent years, however, this outlook has been challenged by findings in Israel’s caves that suggest humanity began to take its first tentative steps out of Africa far earlier. Prior to the Al Wusta discovery, however, early dispersals into the Levant were thought to have been unsuccessful, and confined to the forested Mediterranean regions. Now, archaeologists have evidence of humans successfully striking out into the unknown, early in our species’ history. “This discovery for the first time conclusively shows that early members of our species colonised an expansive region of south-west Asia and were not just restricted to the Levant,” said Dr Groucutt. “The ability of these early people to widely colonise this region casts doubt on long-held views that early dispersals out of Africa were localised and unsuccessful.” The researchers predict this fossil will be the first of many tracing the path of human migration across Asia. “What we are arguing for here is that there were multiple dispersals out of Africa, so the process of the movement and colonisation of Eurasia was far more complicated than our textbooks tell us,” said Professor Petraglia.